Owner retiring and selling a landmark restaurant in beautiful mountain community. Bring your concept and serve on outdoor patios in the pines. Weddings? How about a place of your own to host community events? This restaurant is large enough to do most anything you want. Perfect location right next to a BRAND NEW COMMUNITY CENTER currently being built. If you ever dreamed of getting out of the rat race and living "the life" in a small town community, you should check out this very cool restaurant in Idyllwild. 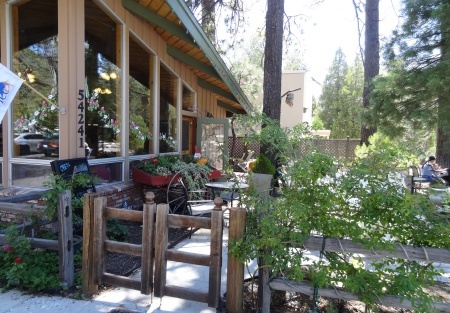 Located in the San Jacinto mountains among tall pines, the beauty is breath-taking and you can own a restaurant with your own concept or expand on the current one. Currently serving Eurpoean baked goods and light fare breakfast and lunch, this restaurant has everything you need to run a full on menu. Bring your own concept to an artistic community among tall pines, that is desperate for quality cuisine. Join local community events like The Art Walk and serve Picnic Baskets to the thousands attending the Summer Concert series. This location is Right Next to these concerts which invite huge tourism. Owner is open limited hours due to health issues and is missing the dinner crowd. This place has all the equiptment you need including a hood large enough (12 ft) to do most anything. 1,000 gallon grease interceptor in place, Back Flow Device installed, plenty of parking, a repaved lot and seating for 60 incl front patio. Front patio is probably the finest dining spot anywhere, your patrons can sit in the quiet of the forest and enjoy their meals and the beauty of nature. A rear deck is used for private events and Oktoberfest and can be put into use full time with an expanded menu and hours. 41 beer and wine license included. Located one hour from Palm Springs, this would be an awesome place to retire. Current owner wants to retire and is open to many scenerios. Rent-Lease/Option and OWC. If interested, please inquire about both.